The MPC++ Version 2 meta-level architecture is proposed. The architecture makes it possible to incorporate new optimizers into a compiler. A library designer can provide an optimizer specific to his class/template library in the library header file. A library user may use such a high-performance library by including the header file. A meta-level programming library, called DMSF, is designed to facilitate programming optimizers. 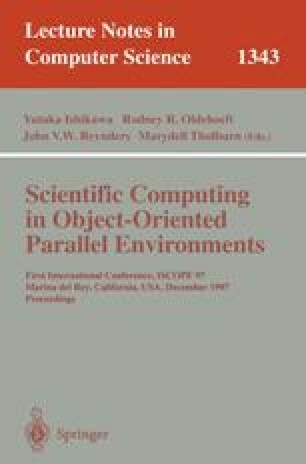 As an example, a distributed array class in a parallel environment is introduced and its optimization program is presented. The optimizer is simple to describe, and it is effective. Evaluation using the CG kernel of NAS Parallel Benchmark shows that the program optimized by the meta-level optimizer runs almost as fast as the equivalent C program.